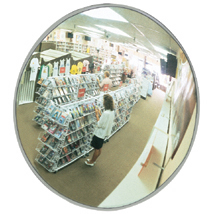 Indoor/outdoor convex security mirrors provide safety and security at every corner. Security mirrors are constructed from distortion free lightweight acrylic. Include a steel swivel mount and mounting bracket for quick and easy mounting. Unique sealed housing and rust-free body makes this mirror work for both indoor and outdoor settings. Safeguard entrances and exits and scan unguarded aisles and eliminate blind intersections.